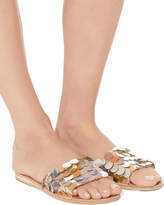 Product Details A metallic sequin upper makes these sandals party-ready. Open toe. Sequin upper. Leather lining. Rubber sole. In silver. Made in Greece. Item listed in Italian sizing please make note of accurate size conversions.